The National Association of Broadcaster’s annual trade show is underway in Las Vegas. There are thousands of people there, and possibly just as many reporting on it online. I’m not there, and I don’t want to cover every tiny product announcement. What’s that? SDI Video in your Arduino? Not quite. Blackmagic Design have announced a new Arduino Shield for 3G-SDI. This shield lets developers receive and manipulate the control signals embedded within a 3G-SDI signal. This is perfect for tallys and remote camera control. A number of Blackmagic Design cameras can receive CCU controls over SDI, and this shield unlocks a lot of that power to manipulate outside of their ATEM switches. No doubt there will be plenty of developer discussion on the ATEM User forums and BMD Forums as this becomes available. This one is interesting. Lawo is taking a whole heap of broadcast “boxes” and putting that functionality into Virtual Machines! This makes a lot of sense, given the majority of broadcast products I’ve seen in the last few years are essentially PCs in special (expensive) cases. Why can’t I put my phone hybrids, mix engines and audio processors into my VMWare Cluster where it’s got fully-redundant everything? 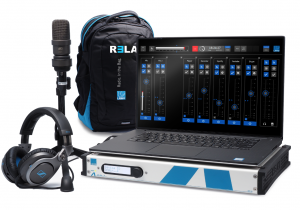 It looks like they’re starting by marketing a laptop-based audio mixer (presumably for outside broadcasts), but it seems this will grow to a full platform to run an entire broadcast facility. There’s quite a few add-ons listed on their website (all “coming soon”). I’m very keen to give this a try, and see how it develops. I also hope they release the engine as a Linux OVF template for easy Windows-free deployment. Nokia have a 360° camera. Now Azure have announced that have the technology to stream this video. As far as I’m concerned, Azure are the cloud provider to watch these days. Lots of innovating products coming from these guys. Watch this space. Blackmagic Design have also announced they are adding IP-video support to some of their existing products, using the TICO codec. They are also updating their Videohub control software so it supports TICO. I’ll be honest, this is the first time I’ve heard of TICO. Is it a bit like Livewire, where it uses Multicast packets to distribute video? I don’t know. What I do know is that it’s low-latency, lossless, and can transport 3x 2160p60 live signals on 10Gbps Ethernet. This is a space to watch. Hopefully this is a product area they see through to completion. Want to send MPX (FM Composite) over a 320Kbps IP link? Now you can! Telos Alliance, Nautel, Moseley and StereoTool (!!!!) have announced a way to do this with the new Micro MPX codec. It applies data compression to the composite output of your processor, which can then be decoded again in the transmitter. According to Telos, this is only proof of concept and there are no commercially available products which support this (yet). However, it’s shown up in the latest release notes for Stereo Tool so perhaps this isn’t that far away. It’ll also be interesting to see what sort of reliability is required of the IP link. Can it withstand lost packets over a public IP link? Let’s hope this is more commercially successful than MPX over AES-192 announced a couple of years back. Finally! The new Omnia 11 software update adds a Declipper (and also apparently makes the UI blue, rather than red – innovation!). This technology has been in the Omnia 9 for years, and is finally making it’s way into the “flagship” audio processing product. This is long overdue, and closes the gap between these two products. Those of us who invested in the Omnia 11 early in it’s product cycle were disappointed how slowly it developed compared to the even newer Omnia 9 (which implemented lots of the cool tech found in Stereo Tool). Do both these products have the same declipper? Not sure. I haven’t even seen a proper announcement for this one – only a passing mention in a show-floor video. Broadcast Bionics have a new product that records studio audio, transcribes in to text on the fly, and then lets you edit the audio by editing the text. Don’t like that question? Delete it. Prefer those segments to be in a different order? Cut and paste. This is an interesting approach to video editing. Usually you edit the media someone will be consuming (video and audio), but this is adding an intermediate to presumably help broadcasters output content faster. They call it “object-based editing”. It’ll be fascinating to see this in action. No doubt there’s still more to come. As I write this, it’s barely 2pm on Day 1. Post in the comments below if there’s anything cool I’ve missed.